The X5 Lightweight Transit Wheelchair is designed for both occasional and frequent use, and can be used indoors and outdoors. The X5 Lightweight Transit Wheelchair is designed for a single occupant of up to 115kg. The X5 Lightweight Transit Wheelchair can be manually moved in forward and reverse and is propelled either by the wheelchair occupant. 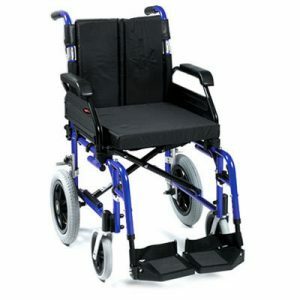 Adjustments may be made to the wheelchair to suit a user’s individual requirements. To complement the X5 Lightweight Transit Wheelchair offers an array of added features with a value-for-money price tag which will be hard to beat. 12½” transit wheel, both with quick release mechanism.